ACS Catalysis, 6, 2435-2442 (2016). DOI: 10.1021/acscatal.5b02613. Designed catalyst poisons can be deliberately added in various reactions for tuning chemoselectivity. In general, the poisons are “transient” selectivity modifiers that are readily leached out during reactions and thus should be continuously fed to maintain the selectivity. 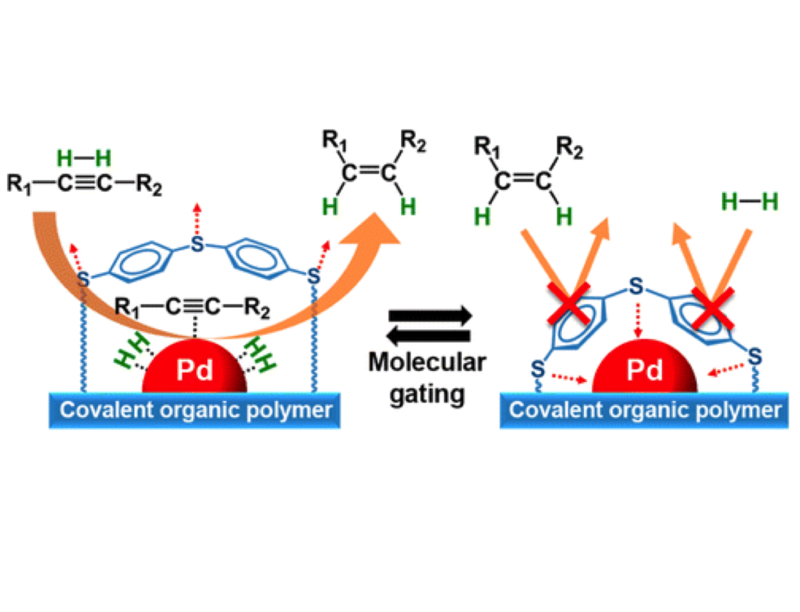 In this work, we supported Pd catalysts on a thermochemically stable cross-linked polymer containing diphenyl sulfide linkages, which can simultaneously act as a catalyst support and a “permanent” selectivity modifier. The entire surfaces of the Pd clusters were ligated (or poisoned) by sulfide groups of the polymer support. 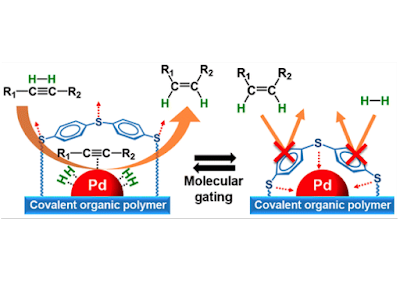 The sulfide groups capping the Pd surface behaved like a “molecular gate” that enabled exceptionally discriminative adsorption of alkynes over alkenes. H2/D2 isotope exchange revealed that the capped Pd surface alone is inactive for H2 (or D2) dissociation, but in the presence of coflowing acetylene (alkyne), it becomes active for H2 dissociation as well as acetylene hydrogenation. The results indicated that acetylene adsorbs on the Pd surface and enables cooperative adsorption of H2. In contrast, ethylene (alkene) did not facilitate H2–D2 exchange, and hydrogenation of ethylene was not observed. The results indicated that alkynes can induce decapping of the sulfide groups from the Pd surface, while alkenes with weaker adsorption strength cannot. The discriminative adsorption of alkynes over alkenes led to highly chemoselective hydrogenation of various alkynes to alkenes with minimal overhydrogenation and the conversion of side functional groups. The catalytic functions can be retained over a long reaction period due to the high thermochemical stability of the polymer.